Domino has a lot to contend with as 'Motor Crush' picks up from the last issue when she comes face to face with her long-lost mother figure, Juli. There's little time for answers as the Crush facility is poised to blow. 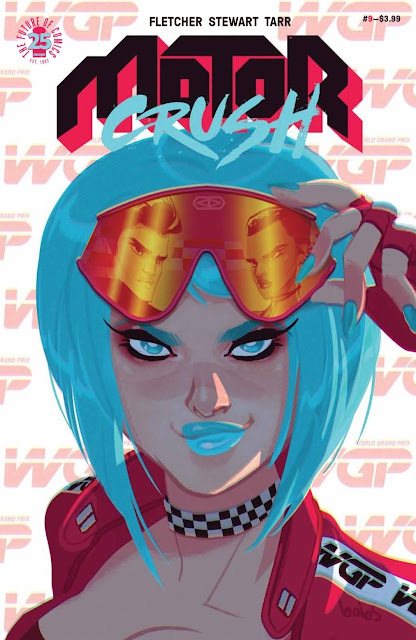 Brenden Fletcher and Cameron Stewart have put Domino Swift through the ringer during 'Motor Crush's run and no moment may have been as devasting as seeing her mother appear at the end of the last issue. The woman that helped raise her disappeared years ago and through the opening flashback, we see the caring and nurturing influence she was with her. Now, Juli is some kind of supernatural figure powered by Crush with faint recognition of Domino and their past together. Dom rightly demands answers but it's too chaotic in the facility to get them. The first half of the issue is a heartbreaking tour de force with so much going on, artist Babs Tarr expertly juggles it all without losing the pace and rush of the story reveals and danger. It's a whirlwind of emotion and conflict. Protagonists must endure countless trials and tribulations to earn their triumphs but Domino has gone through so much as to find the writers cruel in their deconstruction of the once cocky professional racer. This latest revelation is just another traumatic event Domino must overcome. The second half finds Domino exhausted, humbled, and looking for help. Her drama hits home for Lola when Beatriz becomes a target herself. Domino must reach out to others and finds more than she bargained for in the process. It sets up an uneasy alliance with major implications. It's a draining emotional thrill ride in issue nine but issue ten just may be the climax that turns things around for Domino. Again, Tarr provides an indelible visual treat that may be her best of the series. The neon-colored chaos of the facility gives way to more neutral hues of life back home. It's the perfect color choice in order to decompress from such an adrenaline rush of the first half. No one does character designs like Tarr. They might be a bit cartoonish and exaggerated at times but they carry weight to the story. Their diversity is also a welcomed approach as they should be. 'Motor Crush' is a roller coaster of sentiment, color, and speed. Poor Domino has gone through Hell and back but remains resilient. This eye-opening issue cuts to the heart and propels Domino and friends on another potentially dangerous mission. No rest for the weary but the series returns in February to allow everyone to recuperate in the meantime. Plus, it'll give new readers time to catch-up on this exciting series.